Mooncake is a must-eat snack during Mid-Autumn festival (中秋節) that I grew up with. 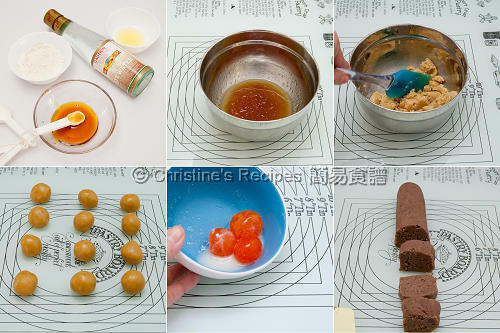 Once you gather all ingredients needed for making your own mooncakes, you'll feel not that difficult as you thought. Mid-Autumn festival (中秋節) is celebrated on the 15th day of the 8th month in the lunar calendar every year. So we finished this year’s celebration two weeks ago. You might’ve wondered why this recipe comes so late. Actually, I've also juggled whether I post its English translation this year or keep the draft until next year since I posted the Chinese version. Here you go, the traditional mooncake recipe that’s been sitting for a long time in my draft folder has come alive on this blog. As I need more time working on my cookbook project, the posting on this blog has been slow down a bit. Yet, I've been cooking and working very hard. For the past few weeks, I uploaded a few batches of recipes and photos to my editor. Thank you all for bearing with me for such a slow posting pace recently. Use a large bowl, mix the golden syrup, alkaline water and oil well. Sift in the flour. Use a spatula to combine all ingredients. Don’t over-stir. Knead into a dough. Cover with a film wrap and rest for 40 minutes. Mix egg yolks with wine. If the salted egg yolks are homemade and freshly broken from the shells, you’ll see the egg whites would turn opaque after mixing with the wine a few minutes later. Wipe dry the yolks with kitchen paper. Cut each into two halves. Set aside. Roll lotus paste into a long tube. Cut into 12 equal portions, each 35 grams. Roll each portion into a ball shape. Set aside. Preheat oven to 180C (356F). Prepare the egg wash: whisk the egg yolk with the egg white. Sift through a fine sieve. Divide the dough into 12 equal portions. Roll each portion into a small ball shape. Cover a dough portion with a plastic film and roll into a thin disc. Then take a lotus paste ball and poke a hole in the middle with your finger. Place egg yolk inside. Roll and shape into a ball. Wrap and seal the lotus paste ball with the dough disc. Spray the mooncake mould and place the stuffed mooncake into the mould. 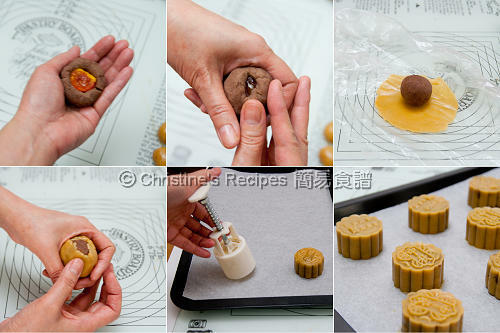 Lightly press the mould handle, then remove the mooncake from the mould. Transfer the stuffed mooncake onto a lined baking tray. Repeat this step to finish the remaining dough and lotus paste. Bake in the preheated oven for about 10 to 12 minutes. Brush the mooncakes with egg wash, at about 5 minutes before removing from the oven. Continue to bake until the pastry turns golden brown. Remove from oven and let cool on a wire rack. Store in an air-tight container. The pastry will become soft, called “回油” （literally means ”returns oily and soft’） and shiny in one or two days. Notes: How important is the alkaline water in this recipe? It neutralizes the acid in the golden syrup. It helps to give nice browning on the mooncake pastry. If adding alkaline water too much, the colour will be too dark. If adding not enough, it’s very difficult to brown the mooncake pastry. In this recipe, the amount of alkaline water is very balanced. Please take note that if you use other kind of golden syrup, the amount of alkaline water might need to be adjusted accordingly in order to give a nice browning effect. You might test run with a small amount of dough to see how many alkaline water has to be used properly with your own golden syrup. In this recipe, you might've noticed that no baking powder is needed. 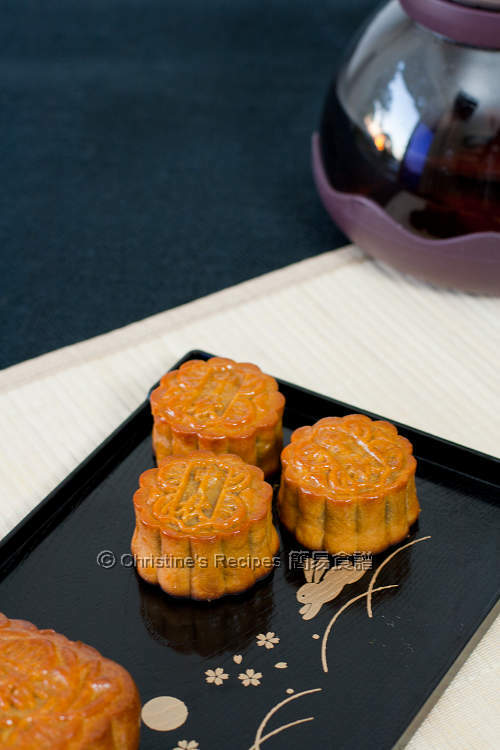 But the mooncake pastry is soft with a bit fluffy texture, that's the effect produced by alkaline water. Side note: The filling shouldn’t have too much moist. Otherwise the pastry will turn moist and sticky after a while. The consistency and texture of filling is controlled by the amount of oil used, not by water. Hope your cookbook is going on well! Traditional mooncake (lotus paste with yolk) is my favorite. I like how thin your baked mooncake skin is. Haven't had one single mooncake this year...those look terrific! Look forward to your cookbook! Wow! I am still in mooncake mood since I didn't bake any this year except for the spiral version. Yours look so gorgeous! I really like your site, giving me a lot of inspirations and bringing me right back to my childhood (a wonderful feeling) :-) Thank you!!! For this recipe, how essential is the alkaline water? Can I drop it? I really like your blogs, your recipe inspired me and bring me right back to my childhood. Thank you!!! How important is the alkaline water in this recipe? Can I substitute it with anything else? Ingredients are kind of limited in this part of the world ~ Gibraltar. 1. It neutralizes the acid in the golden syrup. 2. It helps to give nice browning on the mooncake pastry. Mind you, if adding alkaline water too much, the colour will be too dark. If adding not enough, it’s very difficult to brown the mooncake pastry. In this recipe, the amount of alkaline water is very balanced. Having said that, if you use other kind of golden syrup, the amount of alkaline water might need to be adjusted accordingly in order to give nice browning effect. You can test run with a small amount of dough to see how many alkaline water has to be used properly with your own golden syrup. 3. In this recipe, you might've noticed that no baking powder is needed. 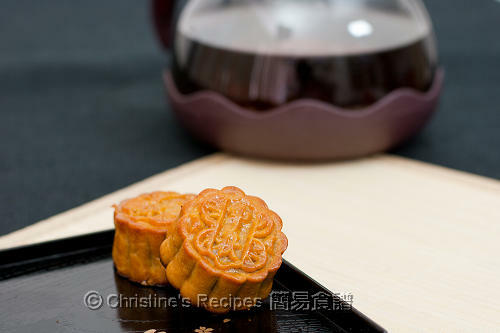 But the mooncake pastry is soft with a bit fluffy texture, that's the effect produced by alkaline water. Can I order the mould from you? I like the chinese characters. If not, where can I buy it from? Thank you. Sorry, I don't sell moulds. I got this mooncake mould from Hong Kong. very pretty mooncakes. I will attempt again next year. i saw some mooncake mold on ebay. The mooncakes look so cute and so kind of you to share all the tips regarding the making of mooncakes. I always have to eat my mooncakes every year. I never thought to make my own. I will have to try this someday. I'm looking forward to trying this recipe! I was wondering, can cooked salted duck egg yolks be used? Those are the only kinds they sell at the Chinese grocery stores here in the US. Thanks! Sure, you can. Cooked salted duck egg yolks are very handy. I'm an amateur at cooking so I apologise If the following question sounds stupid. But do you need to boil the salted eggs in step 2 of this method... but mix it with raw egg whites when washing the egg yolks? Sorry as I don't understand how you would cut the yolks in half otherwise. Have yet to attempt you homemade salted eggs too :/ . Thanking for posting such a wonderful recipe up thou! I love mooncakes and can never seem to get enough of them. So I wanted to lower the possibility of making a messing before attempting this. Would be grateful for your help. Thank you! The salted egg yolk is quite hard, not as soft as the raw egg yolk. You can cut them even before cooking. Very nice moon cake, I cannot believe you can make it at home.